Published by Grand Canyon State Electric Cooperative Association, Inc. There are three Currents magazines published by cooperatives within Arizona. The first is an 8-page publication produced bi-monthly by the statewide. It has a limited 600 circulation to select government officials, cooperative staff and thought leaders within the state. It does not accept advertising. The second is a 32-page publication bi-monthly produced by Ruralite Services for the benefit of Duncan Valley Electric Cooperative, Graham County Electric Cooperative, Electrical District Two and Anza Electric Cooperative, which is located in Anza, California. Combined, the circulation is 15,700. It does accept advertising. The third is a bimonthly tabloid produced by Sulphur Springs Valley Electric Cooperative. The circulation is approximately 37,000. It does accept advertising. 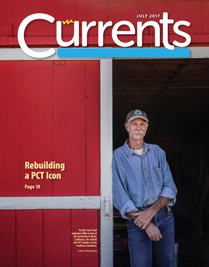 Currents is the unified voice of the utility members of the Grand Canyon State Electric Cooperative Association, providing a source of authoritative information and education for customers, policy makers, and the public.